Kidnapped during an assignment in Afghanistan, photographer Niall O’Sullivan and journalist Philip Korda are hostages in a remote underground bunker outside war-torn Kandahar. Will they be ransomed before their captors run out of patience? Starved and beaten, they despair of ever seeing their loved ones again. As if that weren’t enough, Niall’s ex-brother-in-law, Conor, wants him dead and will stop at nothing to make sure that happens. I had a rather grim cover in mind, showing a prisoner locked in an underground cell, the title in stark, gritty-looking manual Smith Corona type. I had a very specific picture in mind, and it wasn’t something I could order from the Amazon cover service that did my last two covers. I couldn’t find any stock photos that would fit, either. Next, I thought of a night image with a silhouetted man on a gritty city street gazing up at the stars. I started taking photos of alleys and stuff. Then I got interrupted (I’m not complaining) — I had put in for a kitchen remodel back in January. 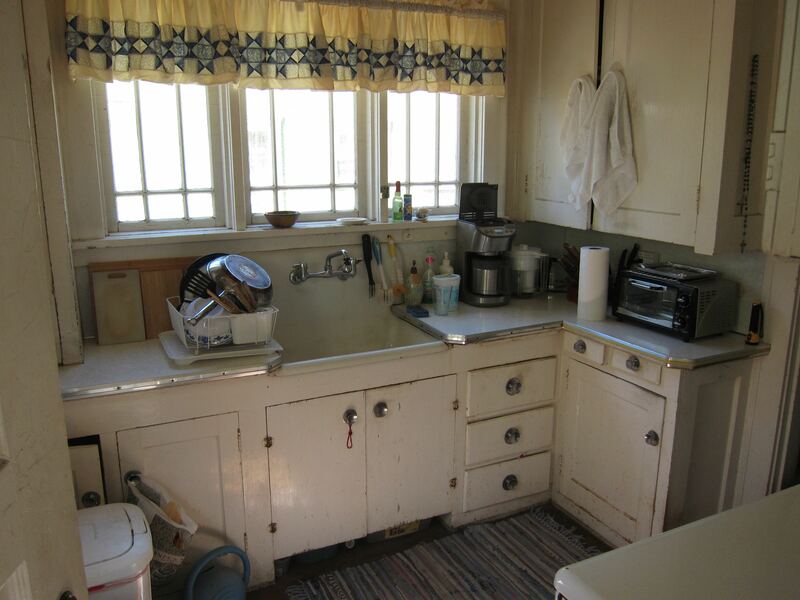 I had fought with a dilapidated kitchen for 15 years and it was way beyond time. The contractor was ready to start. I learned about cabinets, countertops, subway tiles, sinks, and faucets, and it was glorious. I took a few days off from kitchen decisions to go to the Willamette Writers Conference. I cannot recommend this enough. To be in a big hotel where everyone you meet is a writer… writing is a solitary, sometimes lonely business and it’s like a gigantic gathering of your own tribe. Not to mention how much I learned this time around. Full of new ideas, I rewrote Deliver Us From Evil all over again after the conference. Lee Moyer, a book cover artist, was there providing free advice. I brought photos of the first two books in my series. He said Amazon did a great job and that my next cover needs to have the same elements so people will recognize it as belonging to the series; namely the title font, a glowing background, and a darker foreground. Oh. Time to start over. I found stock photos of Afghan children like the kids in Niall’s photographs that could be adapted, but when I was about to buy them, I found that they can’t be used for fictional book covers. In despair, I googled stock photos for book covers and found the most generic stuff you could imagine, the same photos we had to pick from when I wrote online for Demand Media. Hours later, I happened on a site with images to die, or in my case, sign your life away for because they have only a three-year license. I’m trying to find out whether I can change the cover later on without having to change the whole book and ISBN numbers, or whether I will have to keep renewing that not-cheap license every three years. Happily, the cover for my next book, Zen Flowers, will be a lot easier. Tags: Book covers, Kitchen remodel, Lee Moyer, Self-publishing, Willamette Writers Conference, Work in Progress, Writing | Permalink.